The following is from Laurent Gaudé's book, Hear Our Defeats. 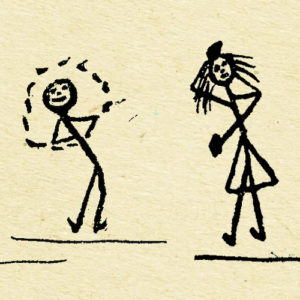 Here, we witness Ethiopian Emperor Haile Selassie's bittersweet return to his country after being exiled by the Italian Fascists. Then Hannibal, leader of the Carthaginians during the Second Punic War, prepares for a showdown with Scipio's Roman forces. 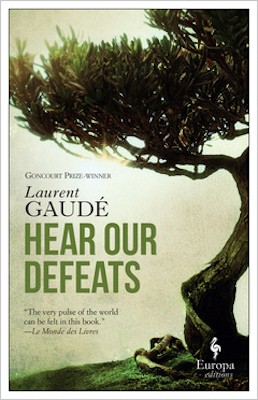 Laurent Gaudé is a French novelist and playwright who won the 2004 Prix Concourt for his novel The Sun of the Scorta. He decides to cross the avenue. Addis Ababa is a beehive of activity. He walks between two cars, their shock absorbers so worn down that the bumpers practically touch the ground; he immerses himself for a moment in the chaos of traffic, then comes out on the other side of the sluggish flow of vehicles. The Americans are in position. He has spotted them. Two outside the building. A third one a bit further along. There must be a few up on the roofs. There is surely a car somewhere, ready to intervene. They are there, the trap is set, and the statue of the lion of Judah looks down on the endless stream of cars and the conspiracies of man with equal indifference. Addis Ababa is jubilant. He enters his city with Wingate by his side. Behind them march the triumphant men of the Gideon Force: Ethiopians, Sudanese, Kenyans, all mingled together, all in rags, but the crowd can’t see that, all destitute, but the crowd cheers them wildly. This war that surrounds them, this war that is causing the world to tremble: the Second World War is offering them victory. The Italians have withdrawn and once again Addis Ababa has its king of kings. They marched from the little village of Um Idla to Mount Belaya where the Gideon Force has its headquarters. They marched and their ranks swelled with each village they passed through, rousing the countryside. They marched to restore the dignity that the League of Nations had stolen from Ethiopia, and today the throngs in the streets are cheering for their Negus, home again at last. The gloom in the building is restful. Two young boys are sitting on the stairs, avidly exchanging notes or photographs. Scarcely looking up, they let him go by. He goes up the stairs. It is not as hot in here. The men from the commando will follow him before long, that much is certain. They will tell the two boys to go and play somewhere else—which they will do, scrambling to pick up their meager treasure. He knows all this. He has experienced similar moments so many times, in other cities. The car will park opposite the building, engine running, door open. The only thing he doesn’t know is whether it will be to take Job away, or to erase all trace of the men who have killed him. The crowd cheers as he goes by. The city is jubilant. Haile Selassie is back in Addis Ababa, and when he left a few years ago it was being ransacked, Addis Ababa that lived through the occupation and tried to fight back, as on that day when nine grenades were thrown at Graziani, nine grenades that should have killed him nine times over, but it is difficult to kill men who live by blood, and fate is oddly considerate sometimes. Graziani got to his feet, and Addis Ababa, which had been holding its breath, had to bow its head again. Today the city is singing, exulting in the passage of its emperor, with Wingate by his side—and he wonders what a victory is, when no battle has been won. It is thanks to the British that he has come back. He did not put the enemy’s armies to flight. Addis Ababa is cheering him but he can still hear the Italian journalists’ insults in Geneva: “Pickaninny!” The country may be celebrating the victory, but he feels as if some part of the defeat at Maychew was never effaced, nor will it ever be. Perhaps it was only by blood that he might have truly avenged the affront? Perhaps he will only truly smile the day Mussolini is hung by his feet on Piazzale Loreto in Milan, like a pig about to be slaughtered? He marches through the streets of Addis Ababa. The crowd screams with joy as he goes by. Now he will reign, he will recover his prerogatives, his court, his people, his power. He will no longer be a fugitive hiding in caves or an exile in the rain of Bath, he will live in grandeur and enjoy the respect of his subjects, and so he is trying to savor this city that is his once again, the warmth surrounding him and that he has missed so much. People everywhere are chanting his name, but he can feel no victory inside, or nothing in any case that is equal to the defeat he suffered, nothing to erase the humiliation at the League of Nations or the endless waiting in Bath, as if defeat always weighed more than victory, as if in the final analysis there could be nothing left in the hearts of men but defeat. It will take a defeat or a victory. That’s the way it is. Hannibal knows this. So many men have died, and they demand to know in which camp History will place them, victors or vanquished. He is about to fight a battle here on these lands he left when he was still a child. An entire lifetime has gone by since the day he took command of the Punic army and crossed the Pyrenees. Years of war and blood, years of thinking, coming up with plans, imagining new tactics. And now he is back at the point of departure: the African coast of the Mediterranean. It is here that the war will come to an end. Everything is in place. Alliances have been forged or broken. Rome has always known how to create discord. Syphax found out about the secret accord between Rome and Masinissa. He flew into a rage and changed sides. For a long time the Roman empire had been allied with the king of the Masaesyli who reigned over western Numidia, but for Scipio this was not enough. He plotted in the shadows to turn Masinissa, the king of the Massylii, and never mind if the two of them were mortal enemies, never mind if, in all likelihood, he had to promise to each of them the other man’s kingdom, never mind, even, if Syphax ended up fighting on the same side as Carthage, outraged at the fact that Scipio brought about a rapprochement with his enemy. Everything is in place and History is clamoring for its battle. Peace proposals were presented, and turned down. The time for negotiations was extended as long as possible. Hannibal met with Scipio: the two men spoke in a tent that snapped in the wind. Two hours of talk that led nowhere. Rome does not want to negotiate. And deep down Hannibal thinks that’s as it should be. He would be ashamed to sign a mediocre peace agreement. He thinks again of his brother, beheaded, and of all the dead of all the past campaigns, and he knows they would have jeered at him in his nights of insomnia. Did he go through all that simply to sign a worthless treaty inside a Roman tent? It may yet happen . . . But not before he has had a chance to fight. And so he sets out his plans with a view to battle. He will position eighty elephants in the front line. And it could be that the Romans will turn pale at the sight of the mastodons. It will remind them of the forty elephants he had when crossing the Alps, how they poured onto the plain of Ticinus. Behind the elephants he will put the Gaulish mercenaries. They are capable of anything. They proved as much at Cannae. Nothing can make them retreat. Then will come the Carthaginians. He has been thinking about it for days already. And he knows that Scipio is doing the same on his side. He saw it in his gaze when they greeted each other. They spoke, and acted as if they were conversing, but each of them was already thinking about tomorrow’s battle. From Hear Our Defeats. Used with permission of Europa Editions. Translation copyright © 2019 by Europa Editions.